Review: Read, Write & Type from Talking Fingers Inc.
Once upon a time (way back in the late 1990’s) I was an undergraduate student studying educational technology and working in a lab school. A lab school is basically a regular school that opens it’s doors to students and researchers in order to use the children in the school as… well, guinea pigs! At that time there was a piece of software new to the market called Read, Write & Type from Talking Fingers Inc. that I had the chance to install on the school’s computers and observe how the children interacted with it and each other while using it. I do believe I even purchased it to put on the computers in my very own classroom after I graduated and got a “real job.” That software still exists to this day and it recently became available to the The Old School House review crew to review. I had to jump on this one! I wondered how it had changed and I was eager to show it my own five year old daughter. For review I received a one-year subscription to Read, Write & Type, which is good for multiple users. What Is Read, Write & Type ? This program is now web-based (an internet connection is needed) although you can still purchase the program on CD-Roms. I may very well have a dusty copy of this one in some deep corner of my basement tucked in with some old college notebooks. It likely wouldn’t work on my modern computers. This program covers many areas of language arts like early reading and phonics, spelling, and keyboarding. It is meant for children who are around the ages of 6-8 years old and it does have features to help children learning English as a second language or those with other special needs. The program was developed by Neuropsychologist Jeannine Herron. This woman has been studying everything and anything related to children and reading since the 1970’s. She is a pioneer in her field, a co-founder and director of the first Head-Start program in the United States. If you want to introduce tried and true, research based, learning to read techniques into your homeschool then you can be rest assured that this program does exactly that. The program breaks apart the keys on a keyboard int something like a town. Each key represents a different “place” in the town. And every key also introduces a reading or phonics skill for the student to learn alongside keyboarding skills. The program conveniently remembers exactly where you child left off the last time they used the program so there is no repeating or redoing to get to the right spot. You can register more than one child for the program and they will each be given their own username and password. Teachers (Parents) have their own log-in and they can follow along to see how their children are progressing. Other features in the parent log-in is the ability to setup how long they can play each day and what days of the week they can play. You can also determine at what percentage correct a child can pass on to the next level in the program. This is a program we use almost daily. My 5 year old is able to access a shortcut on the computer and log herself right in. I have her using a netbook computer with a smaller than average keyboard which makes stretching and reaching for the keys a little easier on her smaller fingers. She is a beginning reader right now. She has some strong skills but I think she leans just a bit on her ability to simply remember words based on site and a little less on phonics and sounds. I like that this program is stretching her. And she feels very sophisticated because she’s gained some keyboarding skills. When away from the program I have found that I am able to get her to listen for the sounds in words when she is trying to figure out how to write and spell. This is nice progress in reading and writing development in my opinion. Has it Changed From Back in the Day? I can’t be 100 percent certain. It has been over 10 years at least since I last had any interaction with it. As far as I can remember I really don’t think so. I do not recall the mulitple log in option. If I remember right every student just jumped in and played from wherever. And I do not recall a teacher (parent) section that allowed for following progress or setting limits. Those things could have existed and I just didn’t take advantage of them. I couldn’t say for sure. I wonder if I have dusty copy of any of my old reports that might shed some light on that! Ha! Here is the thing. It really shouldn’t have changed in all of these years. It works just as it is! It is still as engaging and relevant and educational and fun and all of the these we are expect in programs for our children. But boy did I feel a bit nostalgic when my daughter for logged on. My best advice is to take advantage of the free demo for this program. The first eight lessons are free to use. Give it a try! You won’t be dissapointed! Reading Kingdom Online from Reading Kingdom is an online program for 4 to 10 year old children that can teach them to read up to a 3rd grade level. Many programs rely on phonics alone as the only method for teaching children to read. Unfortunately phonics does have some draw backs. There are many words in our English language that don’t follow the typical phonics rules. This makes learning to read English pretty frustrating. Reading Kingdom takes a different approach and uses six methods to teach reading: Sequencing, Writing, Sounds, Meaning, Grammar, and comprehension. The program is designed to change and adapt to any child moving along at the individual learner’s pace. Joyanna is just 5 years old right now and excited about learning to read. She and I worked on this program together. When your child first logs on they are given a placement test so that the program can understand exactly where to begin. Joyanna is adept with all of her letter sounds (even the letters with multiple sounds). She’s able to read 3 letter words and words with some blends. She can read short sentences with understanding. The placement test involved having the child look at a word and then click choose from a row of letters just those letters found in the word that was seen. Joyanna had no issue with that at all. The next piece of the placement test had her using keyboarding skills. A litter would fall from the top of the screen and she had to find that letter on the keyboard which would lead a little machine on the screen to zap the letter. Joyanna has never really used a keyboard much. She REALLY struggled with this task. She missed MOST letters. After this task she was placed in the pre-reading level. The pre-reading level contains two sections. Seeing Sequences – In this section children have to do the same task I mentioned above in the placement test. They have to select from a row of letters the correct letters, in sequence, from a word they are shown. Joyanna had zero issues with this. After a few days it became tedious for her as there was no challenge. Letter Land – This section is also just like the section I mentioned before where children learn keyboarding skills. They strike a key as the letters fall from the top of the page zapping the letter or popping a bubble containing the letter. Joyanna had more of a challenge with this section. It was a skill she didn’t have. Unfortunately it wasn’t a skill that particularly thrilled her to learn. After playing the tedious Seeing Sequences section she really had no interest in this section. But I urged her to push on. She was successful at it thankfully as I just kept urging her to press on. She just kept asking me when she’d get to read! It was not easy getting Joyanna to persevere however we did finally master Letter Land at which point she was offered a reading assessment so that she could placed in the correct reading level. Reading Kingdom has five levels of readers each containing six books. The children will learn to read the book, write and spell the words in the book, all before the graduate to the next reading level. There is an assessment after each level that ensures the child is ready to move ahead. Joyanna ended up in the very first level. It was rather easy for her. I think her low placement had more to do with how she was feeling about the program at the time than what she could actually do. I could have changed her level myself but I always think review is a good thing. However, she actually moved ahead quite quickly. Every time a new word is presented she was asked to write the word. If she could do so successfully she was able to skip the lesson. If not she would have to do the entire lesson. Here she finally found some success doing what she likes to do and she started to truly enjoy the program. Over all I think it is a great reading program. It is certainly nice that it doesn’t really require much from a parent. I always stayed nearby but if I needed to dash off to turn over laundry or change a baby’s diaper she could keep going on her own. Children can learn to read really well and enjoy the process. The trouble I had with my daughter and this program has more to do with her particular style. Unlike her older brothers computer games are not all that exciting to her. She prefers a crayon and paper. If she can cut and glue she is in heaven. Once we finally got rolling she was pretty set and learning well. At first the whole thing moved pretty slowly. However, once a child learns a word they really really know that word and everything about it. This is a great for building confident reading skills. I’d like to see Joyanna continue with it and I hope I convince her to do so. I don’t often start off a review by gushing about the product. I am blessed to love most of (though not all) of the things I get to review but even still, some things go above and beyond by craziest expectations. Orphs of the Woodlands by Star Toaster is one of them. Don’t even bother reading this review. If you have a young child, particularly a boy who adores reading… get this for them. If you have a young child who would rather do just about anything BUT read… get this for them! Orphs of the Woodlands is an online reading adventure geared towards children in 4th through 7th grade. Notice I said online. This program definitely requires a computer with internet access. To begin each time you use it you input your log in credentials and away you go. We read Treasure of High Tower which is the first interactive book in the Orphs of the Woodlands series. However it is so much more than a book. There is an adventure game woven throughout the story that provides the children with in depth topical learning as well as motivation to keep right on reading the story. A subscription for this program is good for 2 months though extensions are possible upon request. The story is based on a little gray squirrel that the children get to name. Ezra named his Luke (we are in a Star Wars phase here). The squirrel was made an orphan by Night Creatures. There are many orphaned creatures (known as Orphs) in the forest. It is up to the squirrel to not only find the Night Creatures but to care for the Orphs as well. As if that isn’t enough for one little squirrel he must also become a spy and locate treasure before the Night Creatures. I was wondering if the Night Creatures might be a bit scary in some way… they aren’t. They are just described as the things at night we are all afraid of. That’s it. As the child reads through the story he can mouse over highlighted words where he learns more information about the creature, recipes, vocabulary, and other facts. Letters from various characters add even more depth the experience. After completing each chapter the games begin. It is up to Squirrel to rescue as many Orphs as possible. The Orphs live in a place called Ivythwaite in the forest which is where your child must visit. Professor Forp is critical to the learning. He teaches your child math and science through videos hidden throughout the experience. Ezra and Noah both really enjoyed these videos. There was a lot of new and interesting content. Professor Forp is a bit of a character who might have your child laughing a bit. The child also has jobs to complete that are organized into categories like Arts, Vocabulary, Math, Science and Thinking Skills. The jobs earn you gold stars that the child uses to buy things the Orphs need. One of the many unique aspects of this program is that there are opportunities for real life hands-on experiences. While absolutely not required to progress in the game or the story there are recipes for cooking, disappearing ink, and more! For parents that want to be kept in the loop and up to date on their children’s learning emails come straight to inbox. They include a progress report with information like pages read and lessons completed. Statistics on how many Orphs have been rescued and so much more. Both of my boys, ages 7 and 9, used this program daily and very independently. They could get through the chapter and corresponding games and lessons in about a half an hour. The reading material and difficulty is perfectly suited for children in the middle grades. Both of my boys are super strong readers even my 7 year old cruised through the story quickly and with ease. They logged on every day and worked diligently and quickly always begging for more. While my own children do not need motivation to read I want you to have a vision for what this program could do for a more reluctant reader. To be successful on their own in this program a child has to be a reader. However, I could see a child who doesn’t typically care to read without being told to DEVOURING this program. The story is intriguing and fun. The adventure game is exciting. The lessons are in depth and informative. Even advanced readers can gain so much. Star Toaster is offering a free trial so that you can get a taste for the for first chapter and the games. What a great program to supplement, offer as a reward, or to use as part of summer fun on rainy days. We loved this! Adored it! It was just fun and educational and challenging too. Both of my boys ask me nearly daily when the next story in the series will be available. I may not be able to keep them from finishing it all in a day or two once it finally comes out! My little Joyanna is just about a month away from her 5th birthday. She’s definitely not a baby any more. In fact, if we didn’t homeschool she’d be heading to Kindergarten this fall. I just can’t even imagine that! Just like her brothers before her she is a pretty bright kid and therefore she’s becoming quite interested anything that will help her learn to read and write. I think I’ve been in a bit of a denial trying to keep her a baby for a while longer. But time moves on whether I like it or not so when the chance to review First Start Reading from Memoria Press came up I knew I had to take it. For this review I received the teacher’s guide and one complete set of student books that are lettered from A-D.
First Start Reading is a program geared toward children at the kindergarten level. It is the child’s first introduction to the basic phonics sounds. Every letter sound is learned independently through pictures, oral repetition, auditory practice, penmanship, and fun artistic experiences. After a few lessons the children begin to learn to blend the basic sounds they have learned in order to read their first words. With in just a couple of more lessons they are reading short sentences. Book A begins with very easy 3 letter words like Sam, hat, rat, ram, fan etc….The the completion of the first book A the child has worked through ten letters and the digraph of (th). They’ve learned thirty-six words plus an ending sound of (st). In books B and C the letters are continued until all are complete. Book D focuses on additional vowel sounds, more digraphs and blends. This is pretty straight forward, pretty traditional reading curriculum that uses the power of phonics to create success. The teacher’s manual makes things very easy to follow. Any parent who is nervous about teaching a child to read will find a great resource here. This program also helps children learn to write the words the learning to read. There is space for children to practice tracing or free writing all of the letters and words they are learning about. Joyanna was just thrilled to have her own work to do and so she was generally pretty enthusiastic to use this 4 or 5 times a week! We did just a couple of pages at a time. Each time we sat down I’d review with her a few things from previous lessons before we dove into the new pages. I strived to keep work time to just 15 or so minutes a day. Often we worked twice a day just because she wanted to. If she appeared at all stressed we either went back to practice things she was pretty confident about or just put it away entirely. At this young of an age I want her to feel successful as often as possible. I love how there it a good deal of repetition and practice. I think this is key for any reading program. When you begin a new lesson you start by discussing the new letter sounds and accompanying picture. You and your child practice making the sound. To keep things light and fun we got a little silly with the sounds sometimes. As she colored the pictures in the book I would do some ear training exercises with her. We’d listen for words that started with the sound we working on. We used our magnet board to practice drawing the letter. Finally she’d draw a picture of her own of an object that started with that sound. When lessons involved learning new words things went a little bit differently. First we would practice blending the sounds and reading the words on the page. Next we would read the sentences. After that we’d trace the words and then finally we would illustrate a picture of one of the sentences. Eventually as the books progress the sentences turn into short stories. I like the simplicity of it. It is engaging yet clean and nothing on the pages are distracting. The lessons have straightforward pattern that rely on repetition and practice which are things I value in a reading curriculum. Progress is gradual yet not so slow that it becomes boring. The one drawback I find is that there is quite a bit of writing involved. I could see a child who is ready and excited to read by get discouraged if their fine motor skills aren’t up to the task of writing. I think you can simply skip the writing and focus on the reading if you so desire. Then when the time is right you can focus on writing. Joyanna is definitely enjoying this program. It’ll be on our daily list of must-dos for a while I imagine. She’s awfully proud to be reading full sentences and she’s now trying to sound out just about every piece of print she comes across anywhere in her world. I’d say I’m a proud Momma! 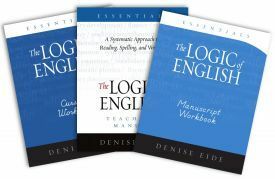 For the past several weeks my family had the opportunity to review Essentials: Logic of English Complete Set by Logic of English. The Essentials program from Logic of English is designed to help you teach your children reading, spelling, and writing. The program is designed for children ages 7 through adults. It was designed with the intent that even struggling students, those with Dyslexia, ESL students or even those who simply struggle with reading and spelling) could excel. It truly is a systematic phonics program. To accompany the Essentials program we also received the Phonics with Phonograms App for the iPad or iPhone as well. I’ll discuss the app further on down below. The Essentials Teacher’s Manual ($95) is a sturdy hardcover book that should last you through years of use and several children. In total you will find 40 scripted, organized and detailed lessons. The lessons contain 3 parts including learning phonograms, spelling, and grammar. The Essentials Student Workbook in Cursive or Manuscript($25) is a softback book that contains the consumable workbook type pages that the children use every day. The ages are perforated for easy removal from the large workbook. We store them in a separate folder. The Basic Phonogram Flashcards ($18) are pretty integral to the program. Remembering the many phonograms makes reading and spelling that much easier. All of the many flashcards that complete the program come on sturdy shiny cardstock. They are color coded making them easy to identify quickly. I chose to keep the cards we were currently using in a coupon file folder and while the cards we haven’t gotten to just yet are rubber banded in a basket near by. At a first glance the program can look overwhelming. I carried the teacher’s manual around for a couple of days trying to wrap my brain around everything. In actuality this was probably not necessary. Once I decided to just dive into it with my children I realized that it program is really quite simple to follow and very much just open and go. I was looking at a very fat teacher’s manual and making things much harder than they needed to be. The teacher’s manual is extensive long before you even begin the lessons. There is a tremendous amount of information about how to teach the phonograms, phonemic awareness such and games that you can try. Essentials offers you five different schedules. These are suggested and by no means required. You can choose from schedules for: struggling readers and spellers, struggling spellers, emerging readers and spellers, young emerging readers, and ESL students. I used the program with my two boys who are 8 and 6. I chose to pay attention to the struggling spellers schedule. Both of my boys are very advanced readers, spelling however is not their strong place. The teacher’s manual suggests the total time per day for this category is 35-65 minutes. This schedule says that one full lesson (with all three of its parts) should be completed every one to two days. This wasn’t our experience at all. Even the very first lesson which was a breeze for my children took us a good 2 or more hours. As we progressed in the lessons I found we could complete a lesson a week across 4 days. In the end I chose to open the book and just do a few activities at a time until my children seemed to be at a good stopping point and ready to move on for the day. As I described before the lessons are broken up into three parts! The first part is all about learning the phonograms… or all of the sounds letters and letter combinations can make and when they make them. Part one also covers exploring sounds and learning spelling rules. In general my boys had a very good concept of all of the basic phonograms (A-Z) so they were able to breeze through this section of the early lessons. Part Two involved spelling dictation. This is where the spelling list is found. I took the words and posted them in our school space and encouraged the children to find ways to use them in other places. Part Three is all about grammar. We covered prefixes, suffixes, parts of speech and all of that fun stuff. Every fifth lesson is a review lesson which I found highly valuable. Spelling rules, grammar, and phonograms we went over a few weeks back came back front and center. I’m a big believer in repetition. My boys especially loved the games that came out of the Phonogram and Spelling Game Book. Anything that makes our learning fun is a real plus. Sometimes our entire lesson would consist of playing just these games. There are quite a few optional activities peppered throughout the pages of the teacher’s manual as well. We mostly chose to skip most of these as the teaching was thorough I didn’t feel we needed the extra practice. However, as we cruise up in lessons I bet we’ll do more of them. Overall I think this is an excellent program and I intend to keep using it. I have no doubt that my boys will turn out to be excellent spellers. Actually, my spelling is going to improve as well. On top of that, we’ve all learned more about grammar than I ever imagined. For example, do you know what ar article adjective is? I do now! So do my boys. This program appeals to the different ways in which my boys think. There are lots of visual, auditory and even kinesthetic activities. It certainly keeps things fun and engaging. My biggest criticism of the program is how long you would REALLY have to spend each and every day to complete this program in a typical school year. There is a tremendous amount to do in each and every lesson and I do believe that as my boys venture further along the lessons will take us even longer. Even the recommended 35 minutes (minimum) per day can seem like a very long time to an active child. Some of the suggested schedules, such as the struggling readers and spellers schedule suggests students should work on the program for over TWO HOURS a day! Chances are if you have a struggling reader and speller they aren’t going have what it takes to dedicate themselves for that length of time. Personally I have no issues using this over two school years and just moving at our own pace as we see fit. If you want a really comprehensive reading, spelling, and grammar program for your children.. this is it! Especially if you don’t mind a longer schedule or feel enough confidence to change the schedule as you see fit for your children. What About That Phonics with Phonograms App? This app is meant to accompany the Essentials program. It allows you set up multiple children so that they can practice their phonograms individual and at their own pace. The phonograms can be reviewed in two different ways. In one situation the child is required to touch each card that appears on the screen and the sounds will be played for the child to hear. The second option is to have all of the sounds spoken as each card is shown. The child then plays something of a card game. The phonograms are spoken aloud and they are required to choose the card with the phonogram they just heard. If they choose the wrong one it is grayed out and they are given another chance to try again. The app collects information for you as the child moves along so the parent is able to see which phonograms the child answered correctly on the first try and which ones they need more work with. There are a total of 10 levels covering 74 of the phonograms. New phonograms are introduced at each level though old ones are reviewed as well. The parent can even setup a customized list of phonograms for the child to work through. Some of the phonograms include spelling hints and suggestions for when it is appropriate to use them. Each of my boys, ages 6 and 8, used this app several times a week. I often handed them the iPad when I found we had a bit of a gap in the schedule or while they waited on me to finish up something with one of the other children. 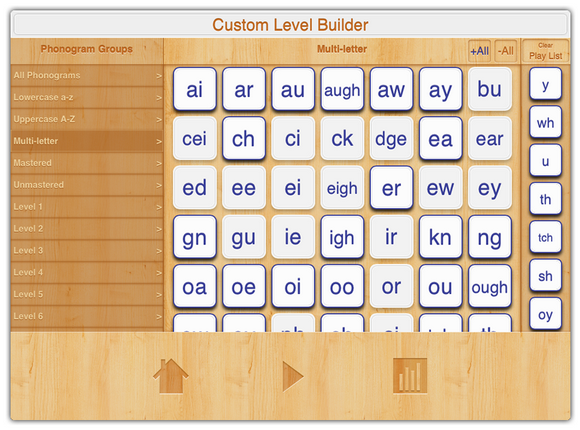 I did not create custom levels for them as I thought a review of all of the phonograms would be most beneficial. The extra practice on the app really helped reinforce their phonograms which intern helped us speed along in our phonogram lessons during our usual Essentials routine. Over all, I thought this was a fantastic app and I appreciate having it in our educational app lineup. It compliments what we are doing in the Essentials program perfectly. A great reinforcer for those important skills that are so essential to reading and spelling. I love that we can use this with multiple children. The ability to create custom levels in very handy. Though it truly follows the Essentials curriculum I could certainly see using this as a stand alone program if one was using a different curriculum. You can purchase it yourself for $2.99! Check out the Logic of English Website for more details. 6 Things My Children Love About Being Read Aloud To! It’s no secret that my children LOVE it when Mommy takes the time to read aloud to them! I often read while they play Legos in their bedroom. I lounge on their bed while they build away. It works perfectly! A couple of weeks ago I shared with you the reasons I think reading aloud to children is so fantastic. You can read that post here. I recently asked my children to share with me why the enjoy being read to so much! Here are their answers. 1. We like to hear about new adventures! We like to pretend we are really IN the story! 2. The more you read to us the more time we have to play Legos! 3. It makes us feel like you care about us because you are spending time with us. 4. It makes us feel happy and calm. 5. We can hear stories that are too hard for us to read by ourselves. 6. We like learning new things in the stories! Do you read aloud to your children? What have been your family’s favorite read alouds? Literature, BOOKS, stories, other worlds, I just LOVE that stuff and fortunately my passion for all things in the world of literature has spilled over onto my children. It’s difficult to get books OUT of their hands at times. I want them to get as much from their reading as I can. 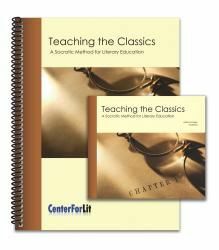 When I saw the opportunity to review Teaching the Classics: A Socratic Method for Literary Education from the Institute for Excellence in Writing I was thrilled. Here is my experience. I admit, I do not remember much about the things I was taught about Literature Analysis way back in my highschool days. Something tells me that at the time I would viewed it as rather boring and not really practicle. I bet you anything I just wanted to be left alone to read the story already! Of course, in my day, Literature Analysis meant memorizing a bunch of terms and filling out worksheets with the correct answers. It didn’t mean lively exciting discussions about the books, the characters, the plot, the setting, and the author’s message. I want lively meaningful thought provoking discussion with my children… not boring worksheets. 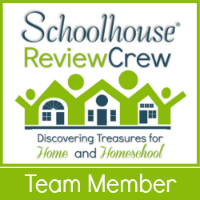 I had hoped Teaching the Classics: A Socratic Method for Literary Education from the Institute for Excellence in Writing would teach me just how to make that happen in our homeschool. I’m sure there are some great college courses or workshops that I could take to refresh my brain on all things Literature Analysis, but who has the time… or the money? That’s where Adam and Missy Andrews come in. These have set out to create a great seminar that is geared toward you, the teacher. For the cost of $89.00 you receive all 6 sessions from a live recording of Andrew teaching the seminar himself on 4 DVDs as well a workbook to use throughout the lessons. The glory of this is that you can view this, all 5 hours and 37 minutes of it, at your own convenience. PLUS you can go back to review it any time you wish! Adam Andrews has a great smooth and engaging style that was relatively entertaining which made viewing the DVD’s pretty fun! Mr. Andrews teaches us how to move away from your basic unit study when reading any piece of literature. Instead asking basic questions such as… What happens to Mr. X in chapter 3? Or having the children memorize and answer vocabulary questions and comprehension questions we engage the children into an unearthing and discussion of important story elements such as: Plot and Conflict, Setting, Character and Theme. Through the videos and the accompanying spiral bound workbook Mr Andrews gives you all of the tools you need to begin this rich type of dialogue with even your youngest children and their picture books. Included within the videos are a couple of great readings of fantastic works of fiction by Beatrix Potter followed by a hands-on demonstration by Mr. Andrews and the live class walking through the process of the literature analysis. The spiral bound book comes complete with clean handouts that can be photocopied for use in your homeschool. As a teacher you will learn how to apply everything Mr. Andrews teaches with your own students. In the Appendix of the notebook you are provided The Socratic List. This is a list of questions you can use with your students to engage them in conversation about the literature you read together. Also provided are extensive reading lists, a list of important literary terms and their definitions, lesson plans, and a blank story chart. Really you are given absolutely everything you need to develop your own curriculum for literature. I intend to casually start talking about these concepts with all of my children, even my preschooler, as we read books together. As we all become more confident and comfortable with the discussion and the terms I’ll continue to up the anti so to speak encouraging deeper levels analysis and conversation. I have cabinets full of wonderful picture books that I think might be a great starting point for our family. If you are interested in bringing more depth to your literature studies then Teaching the Classics: A Socratic Method for Literary Education from the Institute for Excellence in Writing is an absolute must for you! 7 Great Reasons to Read Aloud to Your Children! Once upon a time I figured once my children hit a stage where reading was as natural as breathing that one of my many Mommy jobs would be done! I would be finished with reading aloud to them. Why wouldn’t I be? They could handle it quite well on their own. Now I’m free to do…. other things! Like, I don’t know… laundry! Yeah LAUNDRY! Ok, really? Laundry is better than reading to my kids? Not so much! Truthfully though, in all of my fancy education classes all the way through my Master’s Degree no one ever talked about reading to children AFTER they were solid reader’s in their own right. We only talked about reading aloud as phenomenal tool for developing everything from language skills, prereading skills, fluency, and of course emotional bonding. It never dawned on me that there could be great benefits to reading aloud possibly forever! Also, I never imagined I’d LIKE it either! But I do! I really really do! Let’s talk about some benefits of reading aloud to older, independent readers. It inspires their reading! It is quite an effective way to get my children interested in a new series or introduce my kiddos to a new author. I often choose books to read to them that they might not have chosen to read on their own either because they view the topic as outside of their interest, or because they are intimidated by the size of the book perhaps. What usually happens is they enjoy that book so much that they either reread the book on their own after we are through, or they begin devouring other books in the series or by the same author. Reading aloud gives me a chance to expand their vocabulary. What do you as an adult do when you are engrossed in a story but yet you stumble upon a word you aren’t exactly familiar with? You do the same thing children do, you try to guess at the meaning based on context and then you move on. If you figure it out, great! If you don’t, I doubt you typically take the time to stop and look it up. When Mommy reads aloud Mommy will stop and discuss new words. Truthfully my boys usually stop ME if they are unsure. We’ve learned words together like unconscious and contentious together. Reading aloud gives me a chance to discuss hard topics with my children in a very non-confrontational way. It isn’t uncommon for the characters in fictional books to find themselves in some sort of trouble one way or another. I often pause and ask my children simple questions like, “Do you think he did the right thing?” or “What would you have if this were you?” Boy can those simple questions get the conversation rolling. Then Mommy has a great chance to spout off to wonderful wisdom (LOL) about the situation. Truthfully it’s usually my children who surprise me with their own wisdom. It’s a wonderful way to pass along our family ethics and values. Sometimes we get really side tracked by these conversations. But they are worth every minute. Once in while, when someone in our home does something naughty, we even relate it back to some event in a book we’d previously read together to reinforce the lesson we need to learn. These can be pretty meaningful moments in our home. Reading aloud can help keep us busy! Books are pretty portable. Ebooks are EXTREMELY portable. I often bring our current read aloud along whenever I think we might end up hanging around waiting for something. The doctor’s office is a prime example. A book or kindle is a lot easier to tote around than a bunch of toys! I’ll sneak in little bits of reading while waiting on Daddy to fill up the van at the gas station or run into the store to grab that thing we need. I use it to transition us between activities too. If the kids are getting anxious for dinner but it isn’t quite ready yet… I can read to help pass the time. Usually they ask ME to bring our book… even to the park! Yep, I’ve read to my children as we sat together on an empty play-scape. How fun is that? Reading aloud can help children develop their ability to delay gratification. Truthfully, it takes Mommy longer to read a book aloud than they could read it on their own. Reading aloud is slower. Plus, I only have so much time in a day. If I handed the book over they could surely finish it faster. The beauty is in the slowness sometimes. All of us can really soak up the story! We can pause, think about and discuss what is going on. We can debate about what the author meant, how the character felt, or what we think they should have done. When you read quickly, alone, few take time for any of these things. I know I don’t! PLUS! It’s quite the lesson when Mommy closes the book and we all have to wait until NEXT time to find out what happens next! Oh the GROANS! I love it! Reading aloud can be used as a reward! What’s better than food, candy, or screen time? A lot of time it can be read aloud time with Mommy! Yes, if you step into our home you might actually hear me say… “If you guys don’t stop fighting I am NOT going to read to you tonight!” If we are in the middle of a really good book, the fighting STOPS! Instantly! Like magic! No one wants to have to wait too long to see what happens next! Reading aloud with your children can be an excellent bonding experience! This has got to be my favorite thing about reading aloud. When you read a book together you experience the joys, heartbreaks, traumas, sorrows, and laughter of all of the characters together. I have enjoyed fits of laughter and nearly painful tears right along side my boys. I think I will forever hold the memory sitting on the couch with my 7 year old smooshed in my lap, the two of us pouring our eyes out as we experienced the moment Charlotte died in Charlotte’s Web. We comforted each other and they we rejoiced together as Charlotte’s many babies were born. What an afternoon that was! All because of a book! I bet you are wondering what make a great read aloud for your family! Of course I already mentioned Charlotte’s Web! But if your children have already read that one then I have to suggest the Lily Lapp books that I reviewed here. I know on the surface they seem geared toward girls but have no fear…. I can attest to the fact that boys love them too! These were truly some of the best books I’ve read aloud to my children yet! We all loved them so very much! If you have any good suggestions for excellent read alouds PLEASE share them in the comments! I’m always looking for new ideas and so are my readers! One of my biggest goals for my children’s education is that they grow up just loving to read. Instilling this virtue is, in my opinion a multi-step process. What time is better for fun reading than summer right! Step number 1, and probably key to everything, is finding fun reading selections that your boys will enjoy and even gravitate to. I’ve managed to create two little boys who are voracious readers. I often can’t keep a good supply of books handy as they run through everything I bring home rather quickly. Recently we sat down together and I asked them to list for me their most favorite books ever! Ezra is 5. He began reading simple words as a late 3 year old and then things just took off from there. These days he reads at probably a 4th or 5th grade level though for pleasure reading he often chooses slightly simpler books. I think that’s wonderful. Those are the books that appeal to his 5 year old mind. I often find him hanging out on the couch or his bed, Kindle in hand, hanging upside-down reading. Yes, he likes to hang his head off the couch or bed to read! Noah is 7. He began reading right about age 5. Though he grasped it quickly he didn’t really develop a real heart for reading until I gave him a kindle about a year later. Ever since then there has been no stopping him! I couldn’t tell you where he is at by now as the last time I tried to measure it he scored off the chart. Anything Magic Tree House but most especially #3 Mumies in the Morning and #4 and Pirates Past Noon. Pirates and Mummies are favorite themes for our boys. An obvious choice would be anything in the Boxcar Children’s Series! We’ve picked up a number of them at 2nd hand book stores and for the Kindle. Last year I was able to purchase The BoxCar Children Mysteries Box Set: Books One Through 12 on the kindle for something like $25. I see now the price has gone up dramatically. So it might be wise to get these through another source. In all the investment was well worth it. I’ve lost track of how many times each boy has read through these. I’d say a good 5 times a piece. The A to Z Mysteries are beloved in our home. My boys just LOVE mysteries. It’s probably why the Boxcar Children are such a hit. They have read several and were hard pressed to choose just one favorite. Ezra recently read Penny and Peter by Carolyn Hayward. He read it straight through twice over a couple of days. He originally became interested in the book after I read Here’s a Penny by the same author out loud. My husband has passed on a love for the Hardy Boys. These are books that he read as a child and has since shared them with our boys. We began them as read alouds but then the boys just took off with them on their own. We gathered a few copies from Grandma’s house that once belonged to Daddy. We picked up a few extra’s as Kindle books. The Rescue Team by Billi Tiner is the story of two dogs who form an amazing bond and then go on to help rescue a lost child. Animal books are much adored in our home. This was no exception. The Sign of the Beaver by Elizabeth George Speare is adored by Noah. He just loves animal/animal/outdoor/old time type stories and this classic just fits the bill perfectly. The Mouse and the Motorcycle by Beaverly Clear is one of those books that I read as a child that I just knew I had to share with my own. I had intended to use it as a read aloud but my boys got through it before I could even begin. Dolphin Adventures: A True Story by Wayne Grover. Another animal book! Do you see a trend with my children? This is the true story of how a diver saves the life of an baby dolphin. My boys loved this books so much they’ve worn out the paperback copy that we have. I’m not sure we have a book that is more beloved. My boys LOVE the Little House series! They really seem to be drawn to stories about early America, simpler times and farm life. Of course Charloette Web by E.B. White as well. We originally read this together as a read aloud! Noah and I cried together when Charolette died. Since then they’ve read the book themselves numerous time! Old Mother West Wind is an old classic that I saw one reviewer describe as a combination of Aesop’s fables, Kipling’s rhythm and mischief, and Disney’s cottoncandy sweetness. My boys just adored the fun of the this book. Lightfoot the Deer is another classic described as a wonderfully descriptive tale of the conflict between deer and hunter from the deer’s point of view. Noah said he just felt so drawn into the story. The Aventures of Reddy Fox the Burgess classics just have that timeless quality to them that my boys seem to really enjoy! The Tales of Big and Little by Josh Kilen. This is actually a 3 part books, the first is available free as of this writing. These books are just pure fun. They are shorter and novella like. Each one leaves you at the edge of your seat wanting more! My boys ran through these VERY quickly. What’s on our reading list for this summer? Someone suggested the The Story of the Pony Express to us and I see it is available free! I thought we might give the Chitty Chitty Bang Bang books a try! We may also try and find Babe The Gallant Pig at our library! I’d love to hear some more suggestions from you! What are your children planning to read this summer?